George Mason hadn’t been considered a politically-charged campus, nor had it been the focus of large demonstrations that characterized many other college campuses during the 1960s and 70s. There were some incidences of political activism on the part of both students and faculty on Mason’s otherwise relatively quiet campus. In some cases students took the lead in organizing and/or participating in acts of protest, such as the March on the Pentagon in 1967, the ill-fated Student Strike and Vietnam War Moratorium events of 1969, and the Kent State flagpole incident of 1970. In others members of the faculty served as catalysts for student and faculty action. A few George Mason faculty members may have lost their jobs because of their political activism. At least one, Dr. James M. Shea, went to prison for his beliefs. During the late 1960s popular faculty members Lawrence Leftoff, Ruth Flint, William Tsow, and Dr. James M. Shea came under fire from the administration for encouraging anti-establishment thinking and acts of civil disobedience among their students with regard to the Vietnam War. Administrators such as Dr. Robert C. Krug (Dean of the College) and Chancellor Lorin A. Thompson received complaints from a few students that these faculty members were not following the proscribed course objectives in terms of class readings and discussion, though a much larger number of their students approved of their classroom techniques. Dr. Shea, a professor in the Philosophy department took part in several high-profile acts of civil disobedience and protest over a three-year period. In some cases Dr. Shea encouraged students to participate with him. The Shea controversy was well-documented in the pages of The Gunston Ledger (later Broadside) and in local-area newspapers. He had both supporters and detractors. During the mid-1970s Edmund Frederick Millar, a sociology professor, sparked a controversy that spurred students and faculty to take sides in a case regarding academic freedom and freedom of speech as it applied to a controversial but popular instructor. Millar came under faculty scrutiny after he cancelled class one afternoon so his students could attend a speech by Senator Harry Byrd, Jr. of Virginia, who was up for reelection. The faculty did not seem to have a problem with the class cancellation; what it did have a problem with, however, was how the students’ time was used at the speech. Students allegedly passed out flyers containing anti-Byrd sentiments and statistics to other students at the speech in what some reports called a graded exercise. Millar defended his actions in a letter to the Editor of the Broadside, stating that the “aim [of going to Byrd’s presentation] was holding our elected officials accountable to us.” He maintained that the “action/research project” was “optional and non-graded” (though Broadside interviews of some of his students refuted those claims) and that students used multiple sources to find information and presented what they considered a “balanced” perspective. The senior tenured faculty of the Sociology Department eventually recommended the termination of Millar’s contract. This advice was heeded by Acting President, Dr. Robert C. Krug. Outraged by the lack of information he was given as to what exactly the charges against him were, Millar responded to editorials and student newspaper articles, claiming that he believed the decision was purely political—his professed Marxist philosophy did not resonate well with many others. Students who praised his teaching style or simply sought to protect “academic freedom” and promote student involvement in faculty decisions created the Student Coalition to Retain Fred Millar. Some forty-one faculty members signed a petition to keep him on board, citing his “valuable contributions to the George Mason community.” They asserted that his “radical political perspective enable[s] him to challenge students to question their received ideas about themselves and their society, not only in an academic manner, but in ways which actually result in genuine changes in feeling and attitude,” and that he had sparked student interest in current issues by bringing numerous speakers to the university. While not necessarily supporting Millar, the Student Government passed a resolution stating that it was not happy with what they characterized as a lack of student input regarding the Millar case. 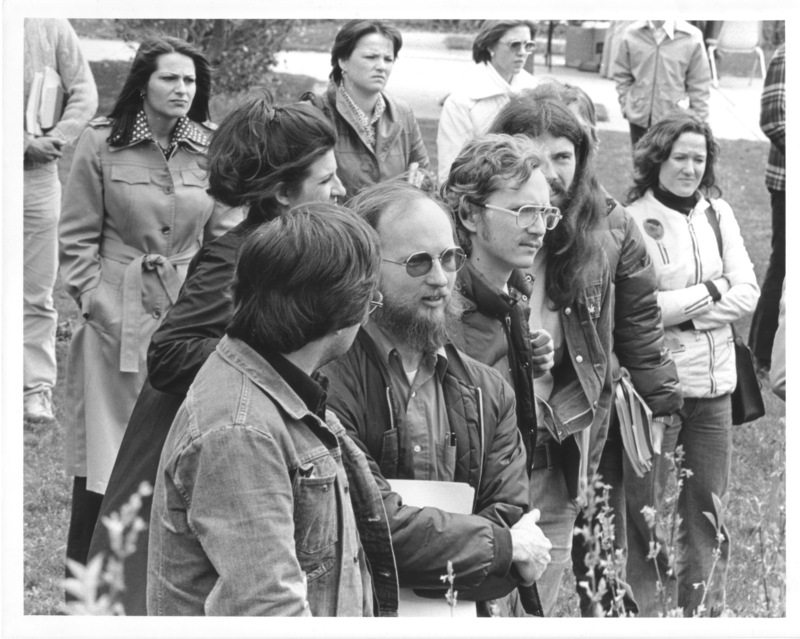 About two hundred students and faculty members attended a rally in support of Millar in April 1977 before a public hearing was to be held on April 13. Dr. Krug received an invitation to the hearing from two members of the Student Coalition, but said that his response—“Thank you for your communication of April 6, 1977”—reflected all his thoughts on the matter. Neither Dr. Krug nor the senior Sociology faculty went to the hearing on April 13 in protest of the Sociology Department’s recommendation in February 1977 that Millar be granted a one-year terminal contract which would end his employment on June 30, 1978. Senior professors of sociology who comprised the committee maintained that they had found “no current evidence that he [Millar] has attempted to improve his teaching” and that Millar “does not reach even minimal standards established in our profession”. The latter comment was largely based upon Millar’s lack of publication in his six years at George Mason; Joseph Scimecca, Chair of the Sociology Department, called publication in peer-reviewed journals “the standard measure of scholarly productivity.” Millar had previously been praised as a “strong and enthusiastic teacher” in a 1975 evaluation, however, and was voted George Mason’s “outstanding teacher of the year” that same year. Believing that strong support for his teaching methods merited reconsideration of his stance, Millar fought to have an open appeal hearing. He was eventually granted one in February 1978 after months of petitioning, citing alleged violations of the Faculty Handbook policy in regard to the handling of his case. The College of Arts and Sciences Committee on Academic Freedom and Tenure voted three to two that the recommendation to grant Millar a one-year terminal contract be reevaluated, but “the tenured faculty voted unanimously, 4 – 0, to uphold the original decision, on March 8, 1978.” The announcement of Millar’s pending dismissal left some students and faculty disillusioned, and the decision, though perhaps welcomed by some in the Sociology Department, still for some in the Mason community “implie[d] that a teacher whose intellectual perspective is somehow unorthodox, whose teachings are unconventional, or who is in some other way out of step with his colleagues is unwelcome at [George Mason].” An atmosphere of intolerance was not one for which the young university was known. The entire affair proved to be yet another of the many growing pains Mason would endure during its development into a major institution. Browse items pertaining to Dr. Edmund F. Millar. The cases of Professors Flint, Leftoff, Tsow, and Shea are described in an untitled essay by an unidentified author (most likely a George Mason student or former student) dated September, 1970.